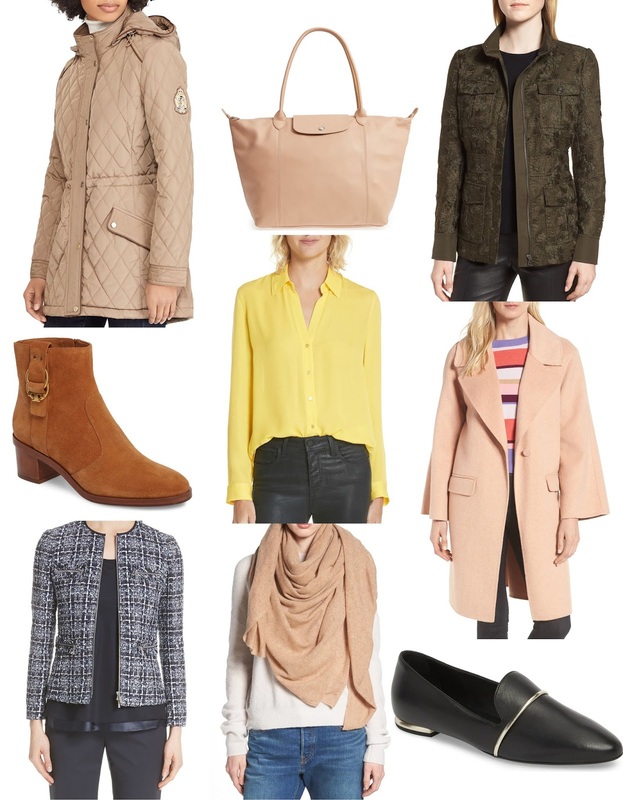 I know there are a ton of things sold out from the Nordstrom Anniversary sale but if you are looking to splurge a bit more on pieces, then you are in luck! Quite a few items are still in stock that are at a bit of a higher price point. I rounded up the most classic and versatile pieces that I liked the most. All the items are linked below. 1. Ralph Lauren Quilted Coat - Classic winter gear should always include a beautiful quilted coat. 2. Longchamp tote - Longchamp makes some of the best totes and this leather one is gorgeous. 3. Lace jacket - It's a military jacket with a lace detail! Yes and YES! 4. Tory Burch boots - Nothing too flashy about these boots and the heel is a wearable height. Simple, understated but still eye-catching. 5. L'Agence silk shirt - I have a large collection of silk shirts in my closet and they never fail me. This yellow is a bit unexpected yet still so chic. 6. Bell Sleeve coat - I don't know what I love more - the bell sleeves or the rose color. 7. Tweed jacket - Perfect with jeans and a camisole for a night out or a pencil skirt and blouse for the office. Tweed jackets are always so versatile. 8. Cashmere scarf - Nothing like a classic cashmere scarf and this one comes in a ton of colors. 9. AGL smoking slipper - I love a good smoking slipper - the silver detail across the front of the shoe completes the whole look.